DETROIT (AP) — This was the type of win that Detroit fans can be encouraged by — not only did the Tigers rally in the late innings, but one of their top young players delivered the key home run. 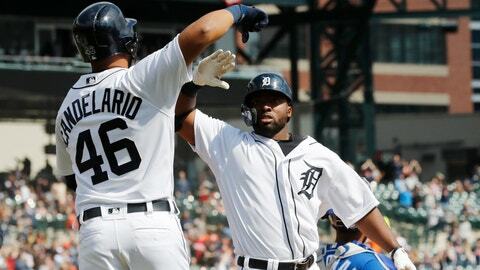 Christin Stewart hit a two-out grand slam in the seventh inning, lifting Detroit to a 7-4 victory over the Kansas City Royals on Saturday. The Tigers trailed 4-2 in the seventh but rallied against Kansas City’s struggling bullpen. Kevin McCarthy (0-1) allowed three hits and a hit batter. The only out on his watch came with the score 4-3, when Alex Gordon threw Josh Harrison out at the plate. Detroit eventually loaded the bases with two out, and Stewart hit a drive down the line in right field off Wily Peralta. Stewart is hitting just .143, but this was the second home run of the season for Detroit’s rookie outfielder. His other one was also big — a 10th-inning shot at Toronto that provided all the scoring in a 2-0 victory in the season opener. After the game, Stewart got the grand slam ball back, giving a fan a signed bat in exchange. Whit Merrifield, Jorge Soler and Hunter Dozier all homered for the Royals, but Kansas City’s bullpen — which entered the game with a 7.45 ERA — couldn’t hold on. Shane Greene pitched a perfect ninth and now has saves in all six Detroit victories this season — without blowing any. The Tigers have won four straight, and the Royals have dropped five in a row. Tigers starter Matt Moore retired the first eight hitters he faced, but he left the game after three innings with a right knee injury. The team announced it as a sprain, although Gardenhire described it afterward as a strain. Detroit announced it would put Moore on the 10-day injured list. Daniel Norris, who pitched three innings in relief of Moore, is joining the rotation in his place. Detroit led 2-0 in the sixth when Merrifield hit a solo shot, extending his hitting streak to 27 games. Kansas City then tied it in the seventh on a home run by Soler, and Dozier hit a two-run homer off Victor Alcantara (2-0) later that inning. Nicholas Castellanos hit an RBI single in the seventh for the Tigers, and Miguel Cabrera followed with a single that could have loaded the bases with nobody out. Instead, third-base coach Dave Clark sent Harrison, who was thrown out at home. One out later, Jeimer Candelario drew a walk that loaded the bases for Stewart. Merrifield’s hitting streak, which dates to last season, is now tied for the second-longest in Royals’ history. Jose Offerman had a 27-game streak in 1998, and George Brett had a 30-game run in 1980. Royals first baseman Frank Schwindel, whose error in the second gave Detroit the game’s first run, singled in the seventh for his first career hit. Cabrera hit an RBI single in the fifth that put the Tigers up 2-0. Moore’s three scoreless innings lowered the ERA for Detroit’s starters to 2.12. The only baserunner he allowed came on the play when he got hurt. He went to the ground to field Billy Hamilton’s bunt to the right of the mound. Hamilton ended up with an infield single and went to second on Moore’s throwing error. Moore finished the inning, then left the game. Kansas City starter Jorge Lopez allowed one earned run in six innings. Royals: RHP Brad Keller (1-0) takes the mound in the series finale Sunday. Because of off days, he’ll be able to start for the third time in Kansas City’s first eight games. Tigers: RHP Tyson Ross (0-1) makes his first home start for Detroit after signing in the offseason.